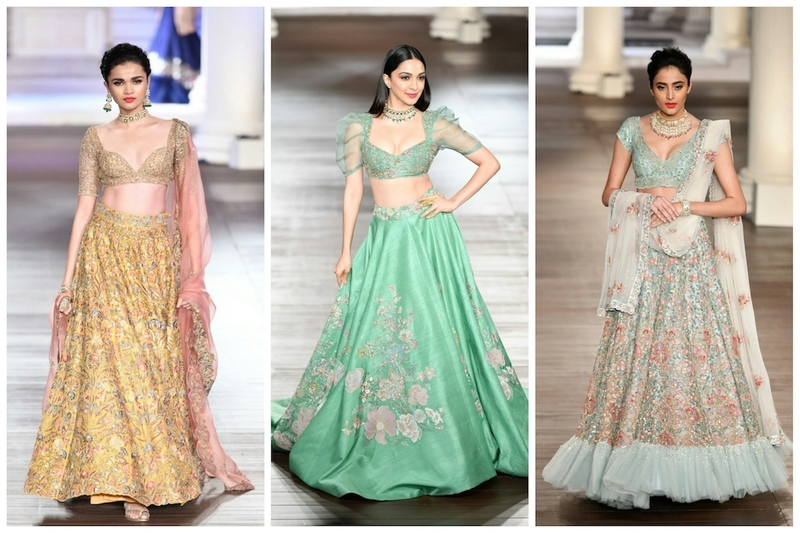 Shyamal Bhumika ICW 2018 collection consisted of some stunning bridal lehengas, grooms wear sherwanis, tons of wedding guest outfits and loads of Indian Wear designs. Every year, Shyamal & Bhumika regulars at couture week present one stunning collection after another. They have always been a crowd favourite. This time was no different. Probably one of the only few designer duos who doesn’t release any bridal wear prices online. Its safe to assume one has to have a healthy budget to afford one of their designs. But today let’s not focus on the money part of it. If you are new to the name Shyamal & Bhumika, some of these earlier blog posts will help you learn more about their style. I thought this time, let’s start with grooms-wear fashion first. Simple, sophisticated, the designs are elegant. You have a limited number of choices for evening party, and main wedding function. But the outfits are pretty darn good. I mean, there is not much to do with menswear as is. So this is standard ok-ok fashion. I cannot get over how cute Kiara Advani looks in her apple green lehenga. Those sleeves are totally trending this wedding season and looks so-so good. Well, to be fair, everything looks good on Kiara Advani. I wonder though if the sleeves really is going to be a hit with real brides. Something we will have to wait and watch. The lehenga on its own stands out because of its unique colour shade. Apple green is relatively new. I don’t remember seeing that many lehengas in this shade. If you are looking for a unique looking lehenga for your wedding, this can be it. I always say if you choose the right red for your bridal lehenga, you’re set. Irrespective of whether it has heavy or light embroidery, the colour just shines through. Shyamal Bhumika ICW 2018 collection showcased four gorgeous red bridal lehengas in different styles which you can choose to pick for your wedding to prewedding functions. The off shoulder blouse red monotone lehenga is my pick from this set. It has a lovely train at the back, giving that royal feel and the colour of the lehenga will photograph amazing. What colour shade is this? No, I am not even going to try to attempt an answer to that. Whatever it is, it is pretty. Light pastel shades are a big favourite since the past few seasons. This one is definitely a newish colour. I didn’t think at first I would like it. But for a sister of the bride, this is gorgeous for the reception night or even for a cocktail/sangeet function. What I love about Shyamal & Bhumika is that while their designs are extremely rich, opulent style. It doesn’t hurt the eye. They manage to balance the bling with sophistication factor pretty darn well. So while a lot of things are going on with this yellow lehenga with the sheer gold blouse, and the uber heavy lehenga skirt, it still looks pretty simple and sober.